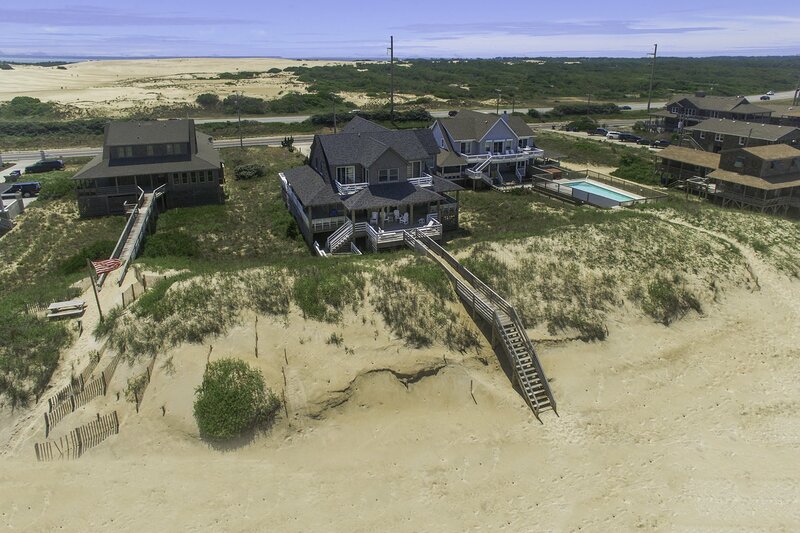 "Journey's End" is a modern Oceanfront home constructed in the traditional Old Nags Head architectural style. Boasting lovely decor, hardwood floors throughout, tongue & groove Juniper walls, 10 Ft. ceilings on the main level, 9 Ft. ceilings on the top floor, & 1960’s decorative old beach juke box (Does Not Work), & multiple furnished decks & views of both the Ocean & Jockey's Ridge, this vacation retreat is the perfect destination for your family. Spend your days basking in the sun, take a leisurely stroll along the uncrowded beach, watch hang gliders soar down Jockey's Ridge or relax in the Hot Tub. Located in the heart of the Nags Head historic district, this charming home combines the best in both comfort & style. Ground Level: Parking for 6 Cars, Covered Entry, Enclosed Outside Shower, & Walkway to Beach. Mid Level: Living/Dining/Kitchen Area, TV, 2 Bedrooms (1 w/King & TV & 1 w/Queen & TV), Half Bath, Full Hall Bath w/Tub/Shower, Covered Deck, Sun Deck, & Walkway to Beach. Top Level: 5 Bedrooms (Ocean Front Master Suite w/King, Daybed & TV Sitting Area, Full Bath w/Tub & Shower Stall, & Private Oceanfront Deck w/Ocean Views; 1 Ocean Front Master Suite w/King, TV, Full Bath w/Tub/Shower, Semi-Private Deck & Ocean Views, 1 w/Queen, TV, & Semi-Oceanfront Private Deck, 1 w/Bunk Set & TV) & Full Hall Bath w/Tub/Shower; Master Suite w/King, TV, refrigerator, microwave & Full Bath w/Tub/Shower). Features include: C/AC & Heat, Washer/Dryer, Dishwasher, Microwave, TVs, DVDs, Wireless Internet, & Deck Furniture. No Pets. This is a Non-Smoking Unit. We loved everything about the house - layout, furnishings, and location. Everything was FABULOUS! We loved it!! We loved the house! We would definitely stay there again. It's beautiful. Between the amazing history, great location and fantastic porches, we can't decide what we loved the most. Thank you for sharing your beautiful home with us! The home is a lovely throwback to old Nags Head and the beach was great.